In a previous post, we took our first look at Kiket Island and the Kukutali Preserve. Recall that this is the newest venue in Washington's Deception Pass State Park. We ended our trek at the beautiful curved beach along the tombolo that ties Kiket Island to little Flagstaff Island. There is an old ruin here, a boathouse with a small laboratory attached. I believe this was a base for researchers from the University of Washington. They conducted several marine biology surveys of the island in the 1970's. On this visit, I want to look at the plant life growing on and around the tombolo. This is a harsh, dry, wind-blown, salty environment with little more than sand and gravel for soil. There are some plants that appear to grow out of solid stone. Remember that plant cycles are continuous in any location. What will be seen blooming will change from week to week. These visits were in late June and early July. As usual, if I have misidentified anything, please let me know. On the path to the tombolo, we pass a large, dense thicket of Oregon Grape (Mahonia aquifolium). I have never seen it growing this densely or vigorously anywhere before. Some plants were 8 feet/2.4 meters tall. 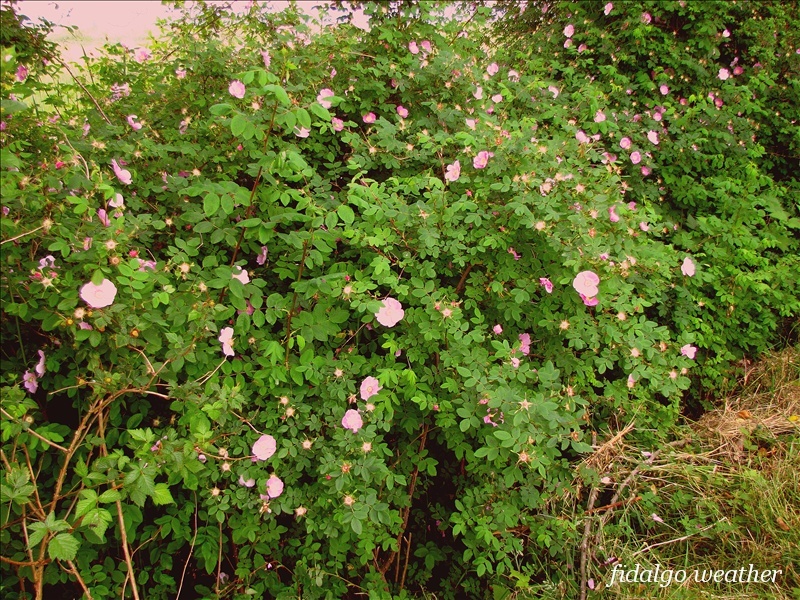 Also lining the trail and the banks along the beaches were thickets of Nootka Rose (Rosa Nutkana) now in full bloom. It will continue blooming until August. Both sides of the tombolo are lined with sloping gravel beaches, here seen at low tide. A tombolo is a sandbar created by tidal currents that ties an island to another land mass. This land form is stabilized and maintained by the currents. The top of the tombolo is a dry, wind-blown strip of grassland. Annual rainfall averages only 20-22 inches/51-56 cm. What little soil there is has came from decaying plant material. There must have been a succession of plant communities here before the conditions were suitable for what we see now. Even in fair weather, the wind seems to blow constantly across the sandbar. Nevertheless, the tombolo supports an amazing variety of plant life. The purple flower here is Tufted Vetch (Vicia cracca) from the Pea family. The white is Common Yarrow (Achillea millefolium). The lacy plant on the right is Silver Burweed (Ambrosia chamissonis). There are several garden varieties of Yarrow. It is a good choice where drought tolerance is needed. If you are wondering what will grow well in your yard, look around and see what grows naturally in your area. What you find will be a good starting point for planning a garden. Using cultivated varieties of local native plants will minimize the needs for irrigation, fertilizer and pesticides. Silver Burweed was an interesting plant that was growing everywhere. On the beach, it grew low to the ground around the driftwood. In the grassy areas it was more upright. It is a plant specific to coastal dunes and gravelly beaches, according to Pojar and McKinnon. Here are closeup views of Common Yarrow. There are varieties that bloom pink, lavender, yellow and red. They are said to repel undesired insects such as mosquitoes, flies and cucumber beetles, while attracting the good ones including lady bugs and bees. Beach Pea, true to its name, was another plant growing right on the beach around the driftwood. Entire-leaved Gumweed is a beautiful Aster with an awkward name. It is another plant specific to rocky shores in maritime habitats. Here it was growing in every environment of the tombolo complex. I have also seen it growing on the beach at Lotte Bay inside Deception Pass State Park. It continues blooming well into October. The beaches and rocky outcrops were host to brown Rockweed (Fucus distichus) and Sea Lettuce (Ulva spp.). When the tide is out, many organisms may be found hiding under the Rockweed. The prevailing winter storms blow from the south. On the more sheltered north beach of the tombolo grows American Glasswort (Salicornia virginica). The plant is halophytic which means it is salt tolerant. Also known as Sea Asparagus and Pickleweed, it is sold as a salad green in seafood stores and chic restaurants. Salicornia species are being tested as a source of biofuel. They contain 32% oil and can be irrigated with salt water. This is a relative of English Plantain or Buckthorn, that pesky weed in your lawn. Sea Plantain is an attractive little plant growing at the top of the beach and from rock crevices. Lichens are fungi that have incorporated algae as a source of photosynthesis and nutrition. I am finding it extremely difficult to identify them. This must be a highly specialized discipline. In the photo, some parts are dusty patches and others are leafy. I found several similar photos on the internet. All were identified simply as "orange lichen." This one was growing all around the stony sides of Flagstaff Island. It is also seen growing on the stone cliff faces around Bowman Bay in the main park. Finally, it is not possible for me to pass up an opportunity to post a favorite photo subject, the Deception Pass Bridge. It connects Whidbey Island on the left with Fidalgo Island on the right. This view is from the south beach of Kiket just east of the tombolo. Extending to the left, you can also see the reef between Flagstaff and Skagit Islands that is exposed during minus tides. At Wild Fidalgo, you will find a related post from this same visit. It describes an encounter with the rare and charming shorebird called the Black Oystercatcher.